The genteel charms of a Southern vacation are found at Atlantic Breeze, a popular North Myrtle Beach resort in the Crescent Beach section of North Myrtle Beach, SC, are evident as soon as you arrive. From the color palette of the exterior to the welcoming pool deck and a line of chaise lounge chairs that face the sun, this North Myrtle Beach resort welcomes guests from near and far. Atlantic Breeze North Myrtle Beach resort is beautifully landscaped with palm trees. Sea oats sway in the breeze atop the sandy dunes and a nice stretch of white sandy beaches comprise what is the backyard of this stunning resort. As you can imagine the oceanfront views are stunning. And they are enjoyed from a terrific pool deck, which is partially covered, as well as from the private balcony in each of the North Myrtle Beach condominiums at this North Myrtle Beach resort. The oceanfront pool deck at Atlantic Breeze is a favorite amenity for all ages. There are two swimming pools at Atlantic Breeze. The indoor pool is perfect for those who want to stay out of the sun and still go for a refreshing dip. The other swimming pool sparkles in the sunlight, yet offers some shade, too, as it is partially covered. Built on the ground level, the pool deck’s water amenities wind around the pillars of this North Myrtle Beach resort, adding a playground feel to the pool. The lazy river is just three-feet deep, perfect for lounging in an inner tube and riding the lazy current. The pathway of this lazy river is primary under cover though at one point it does emerge from underneath this North Myrtle Beach resort where it is bathed in sunshine. Toddler loves the shallow water of the kiddie pool. This pool is large and is just for the small ones of your family. It is completely covered so you do not have to worry about the youngest members of your family getting a sunburn as they safely play in their own swimming pool. Atlantic Breeze is a North Myrtle Beach resort that has a fitness center on site. Cardio and strength-training machines face the Atlantic Ocean so you have an inspiration view as do your repetitions, run your miles and tone up before hitting the beach. The North Myrtle Beach vacation rentals at Atlantic Breeze feature some terrific amenities that help make your North Myrtle Beach vacation memorable. Each of the North Myrtle Beach condo rentals has a spacious kitchen with full-size appliances. These kitchens are beautifully furnished with cookware, dishes and utensils for your convenience. These condos in North Myrtle Beach, SC even have a dishwasher so clean up is easy. There is typically a washing machine and clothes dryer in these North Myrtle Beach vacation rentals so you can play hard during your North Myrtle Beach vacation and toss clothes into the laundry when necessary. Televisions, DVD players, ceiling fans and high-speed Internet access are also part of these North Myrtle Beach condominiums. The master suites in some of these condos in North Myrtle Beach boast a Jacuzzi tub for your relaxation. 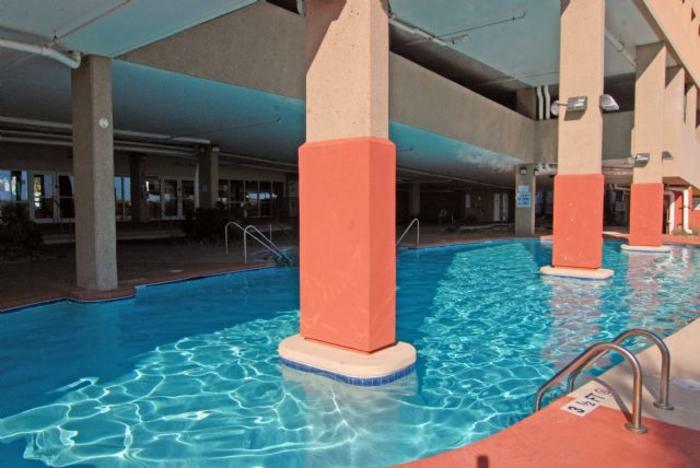 The list of amenities in each of these North Myrtle Beach condominium rentals is extensive. Collectively, the amenities equal a deluxe North Myrtle Beach vacation rental for a magnificent North Myrtle Beach vacation. When you come to North Myrtle Beach for a vacation, the first thing you want is amazing oceanfront views and Atlantic Breeze delivers! The balcony railings in each of these North Myrtle Beach rentals is a glass wall so sitting or standing you can see the Atlantic Ocean and the sandy landscape. And the balconies are furnished so you can read a book, sip your morning coffee, eat lunch and relax after a full day of golf and be comfortable all the while. The condominium doors leading to these spectacular balconies offer a burst of sunshine into the living room of your rental. Bask in the glow of the morning sun or the late afternoon’s twilight as it streams through the balcony doors and into your North Myrtle Beach condominium. Pull up to this oceanfront North Myrtle Beach resort and you don’t readily see the multi-level parking garage. What you do see is a beautiful tower on the oceanfront with nice landscaping and a Mediterranean feel. The parking garage is built right into this striking façade and gives you a fitting place to park with easy access to the elevators. Unloading your luggage and carrying all your souvenirs to your North Myrtle Beach condo is a breeze at Atlantic Breeze.